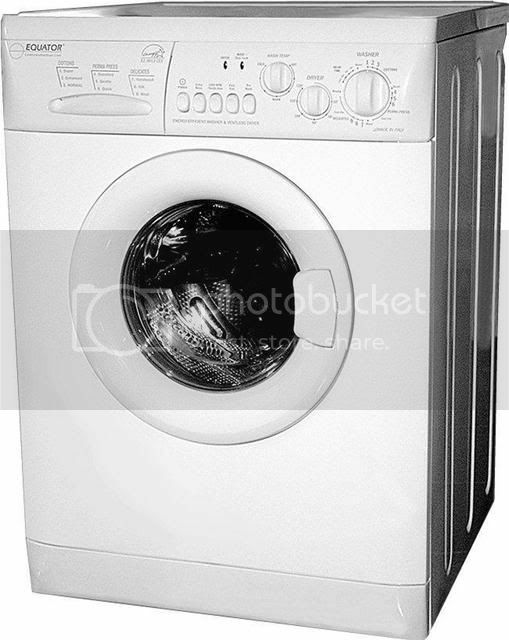 I have an Equator Washer Drier EZ3612CEE (unfortunately). I own this machine for 4 years and it has been repaired 4 or 5 times already. So I am ready to give up but I decide to give it a last shot . I know that whatever I saved with machine energy high efficiency, cost me 10-20 times more in repair cost. But anyway - the machine start again to malfunctioning. In the beginning some water gets in, but the motor does not rotate. Water comes in small portion 2-3 times. After about 1 minute wash timer start to rotate endless (clicking) and water pump start pumping the water out. The light is blinking wired also. After the water is pumped out, the dryer vent motor rotates for another minute and then the machine stops. Please, help me with any possible information. I assume that the control module is gone, but it was replaced once already 2 years ago. If it is - can I find anywhere an electrical diagram of this control module. And how can I check if is bad before I try to order it. It is quite expensive (if I can find it, of course) to order it without knowing that this is the problem. Do you think it can be something else. There are not to many parts in a washer/dryer combo. When the dial starts clunking round, check the start lamp and see if it flashes in a pattern, ie 1-2-3-4-pause-repeat. This is an error code and we may be able to work something out from there. Which bit of "Unplug it" is causing the problem? Stop eMailing me. This is a perfectly good forum - use it! I realy appreciate your respond Penguin. When the dial starts clunking round, the start lamp flashes 2 times and after that 10 sec. is of. And that repeats every 10 seconds on and on (even when the pimp is off already) until I switch off the machine. Assuming the Indesit connection is correct, two flashes suggests a problem with the drive motor. It's possible that the carbon brushes in the drive motor have worn out, broken wiring in the loom between the motor and the pcb or a problem on the pcb itself. I will check motor brushes and the connections between motor and pcb. But, do you know, by chance, if there si any way to check pcb (which I am assuming is the control board). I mean - is there any control points on the board wher man can mesure voltage and check if this part is working properly. I coudn't find an electrical diagram so far. And do you think, since Equator appearantly is Indesit-built, the parts (control board) are exchangeable each other. It is very hard to find any Equator part. There is a rumor they are out of buissness already. Not much else I can tell you, Chicago. I was going purely on the look of the thing - I've got no specific info on it at all. Our friends over at www.appliancejunk.com may be able to tell you more as they're on your side of the pond. I was able to fix the motor. It is a long story, but it was a lose connection. And I think that your advise was a big part of fixing this problem. But now the water does not get heated. In dryer regime the air heater is working, but in washer regime the water gets in and stays with same temerature all the time. Do you have any idea if the air heater is used to heat the water (through the air) in those type of units. Do you know where the water heater is located and how to test it. Because I opened my unit and on lower back side of the drum there is something, but I think this is a sensor. The wires connected to it are so thin that it can not be a heater. I had my washer totaly open and still couldn't get how this machine heat the water. That's why I uploaded some pictures which can be helpfull for somebody how can recognize some parts. This is the link to the pictures. Those pictures shows teh machine from bottom, back and top. I have more pictures if something is not clear I can upload more. Meanwhile I spoke with a technician and he contends that those machines do not have a water heater. They use the hot water from supply line. It may be true but I cannot imagine that. It looks illogical for me. :? Nice pics. This machine is an Indesit build, with the Philco-style tank in it. The bump in the tank to the right of the motor is where the heater would be fitted and isn't. You need to get that motor stabilty bracket secured, BTW or the motor can break off the brackets. The white disc on the rear of the drum is a thermistor, this is your temperature sensor. There should be a couple of wires attached. I presume that the machine is hot and cold fill - it might be worth checking the resistance through the solenoid coil on the hot valve to ensure that hot water can enter the machine. You should get a reading in kOhms. Thanks for your response Penguin45. The wires to the thermistor are attached. They were temporary detached when I was measuring the sensor. And the machine does have hot and cold water fill. And hot water fills in. But in front of the machine there is a knob for wash temperature control. I was thinking that this can control the washing temperature. But obviously, if there isn't a water heater the machine will work only with water from the supply pipe (whatever temperature is there). I think that means I can control only how lower then supply pipe water temperature can be. But not that I can increase the water temperature above hot water from supply line. Well, I guess I should live with it. It'll be a max temperature set-up in that case. It will run the hot valve, then add cold to achieve the wash temperature. Bit basic, but it does mean that you won't get the infamous F8 code!